The Te Ara Kākāriki team and their guests were pleased to experience a pleasantly mild morning for the beginning of Sunday’s Plantout Tour. 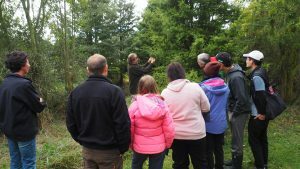 The tour is held annually and provides an opportunity for interested locals to come along and see examples of the trusts work and learn about Canterbury ecology. 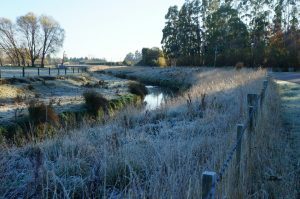 Te Ara Kākāriki Greenway Trust was set up in 2006 to address the lack of natives on the Canterbury Plains. Trustee Peter Joyce explained how the name Te Ara Kākāriki can mean two things: Te Ara means pathway and Kākāriki means green, which refers to the native corridor the trust is aiming to create. Kākāriki Karaka is also the name of the critically endangered Orange fronted Parakeet, of which around only 100 wild birds remain in several Canterbury valleys. 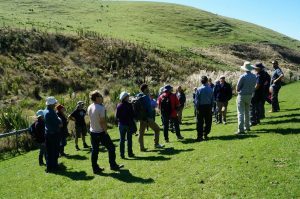 The trust hopes one day the Kakariki will be abundant and use the native corridor they are creating to return to the plains. 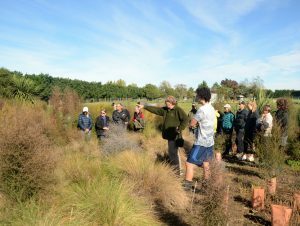 Te Ara Kākāriki Greenway Canterbury Trust has noticed an increase in landowners wanting to plant natives on their property. As well as a lot of people deciding to continue planting year after year as they realise the benefits of it to our ecosystem and the support from the community. Over the past 12 years, we have had a total of 73 native planting sites, including on private lands, with public schools, and on reserves. The average size of these native Greendots currently is 1,000 native trees, and some of them will continue to grow in size. In total, we have recorded over 77,000 native trees. We have just received new applications in November 2018, and we want to thank the overwhelming number of people who applied this year for our assistance in starting their Greendot. While we have more demand for our assistance than funds allow, if you are aware of businesses that would like to make annual donations, please contact [email protected] so that we can continue to grow the greenway to it’s fullest potential. More than 50 guests showed up to the Friends of Te Ara Kākāriki Meeting at Lincoln University. They came to hear the latest updates of the trust, learn about WWF’s recent campaigns from keynote speaker Libby Harrison, and to witness the awarding of the Diana Isaac Cup for outstanding native restoration work in Selwyn. A young ecology student, Tim Logan had the opportunity to showcase his native restoration planting at the first of four sites at an annual Plantout Tour last Sunday. 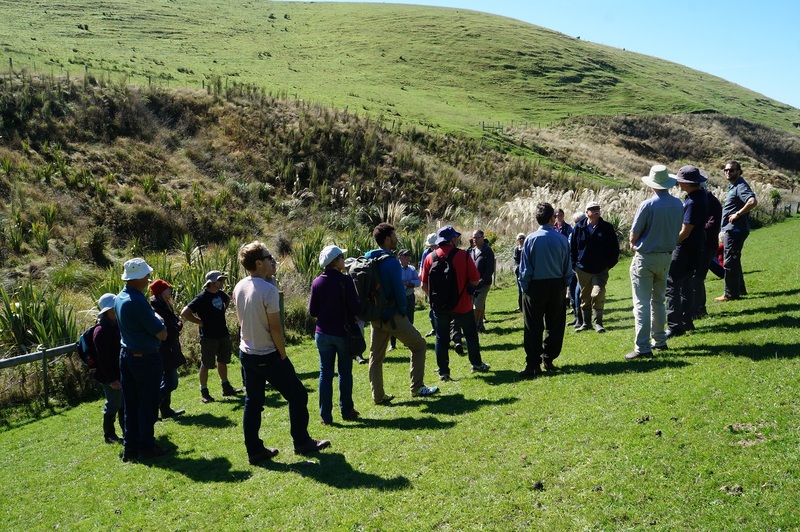 The tour is organized each year by Te Ara Kākāriki (TAK) Greenway Canterbury Trust to educate and motivate local people and community groups to revegetate areas in Selwyn back to Native Habitat. Tim’s West Melton restoration site of about 2,000 native plants provided an inspiring backdrop to the morning tour. As a high school student back in 2012, he convinced his parents to set aside a portion of the family’s lifestyle block for native revegetation. 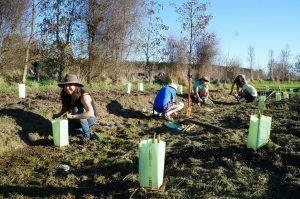 Since then they have planted about 400 native plants each year with the help of volunteers. Tim is now studying ecology at the University of Canterbury and is bursting with more enthusiasm and knowledge year by year. He has started collecting seed and nursing his own seedlings. I hea koe i te ao o te kowhai? Where were you when the kowhai bloomed? 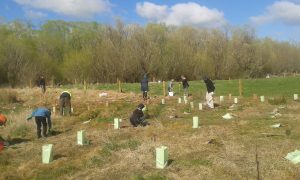 The first school to return to planting in their local environment this year was West Melton primary, at Kowhai Reserve. 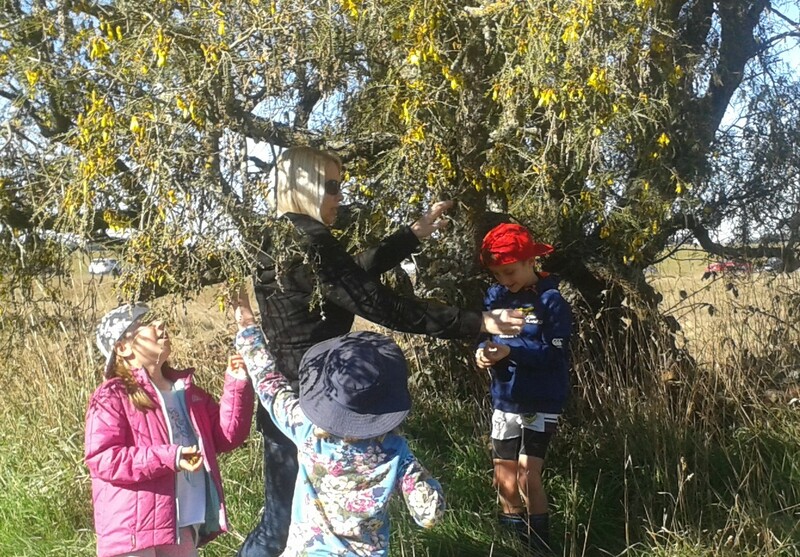 They were blessed with the kowhai flowering everywhere. The theme for their plantout was investigations into natural textures, natural colours and beauty. This was particularly present in a weaving exercise with natural things from the environment. 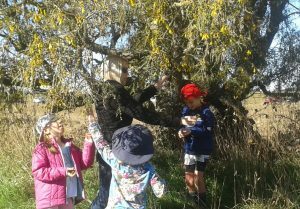 One hundred and thirty two West Melton School students in Years 2 & 3 arrived at Kowhai Reserve / The Willows. Thank you to Environment Canterbury for providing plants and combi guards. Thank you to all the volunteers this season ! Photo above: featuring Plantout on Early Valley Road Sept 30th. We are well on our way to planting over 10,000 native plants this season ! Over 300 volunteers from the Community, and hundreds of school students have participated. 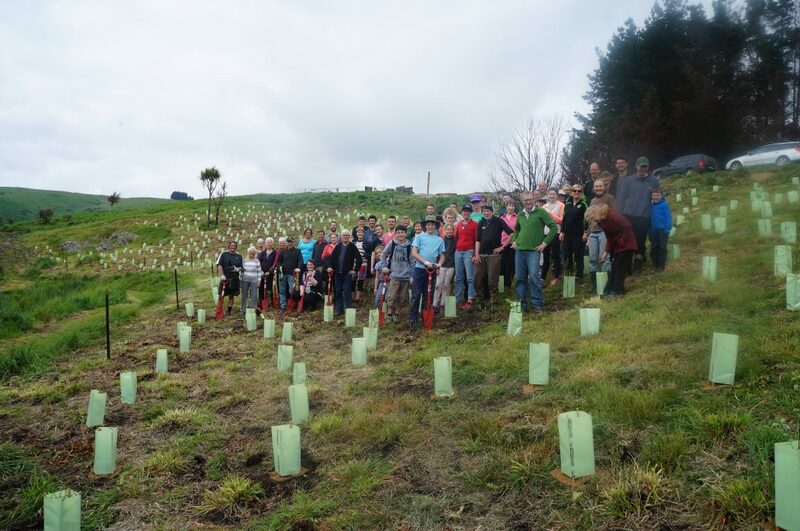 We planted at numerous sites in the Hororata Catchment this year, thanks to our Community Environment Fund focused on this area. 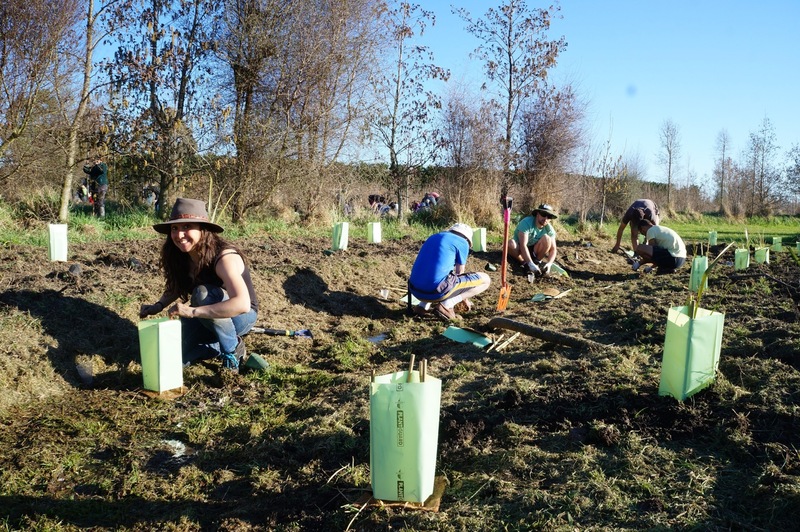 Starting a native planting project on your farm is a lot easier with the right advice and support from the community. 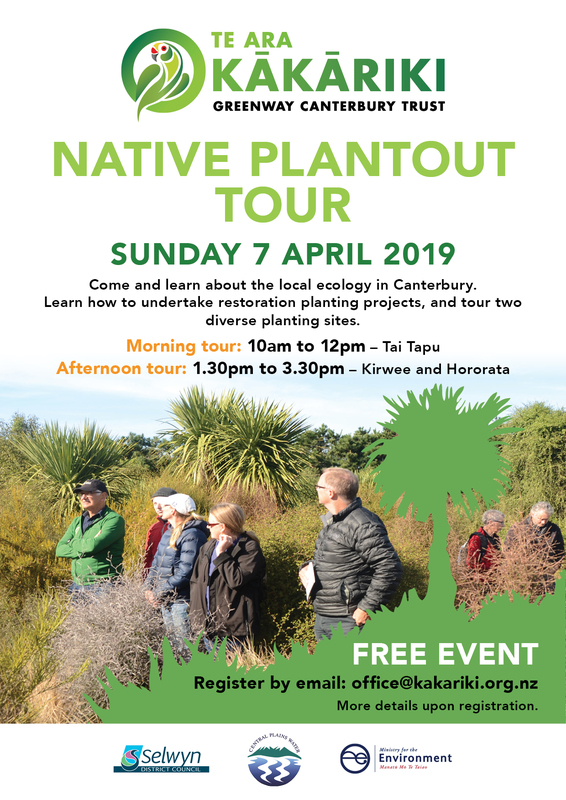 Te Ara Kākāriki Greenway Canterbury Trust hosted our annual Plantout tour on Sunday April 9th in two locations across the Selwyn District with a growing number of interested people. From March to June this year, Lou Drage (TAK) and Matt Stanford (Enviroschools) have been taking small groups of students from our Kids Discovery Plantout schools out for monitoring sessions. 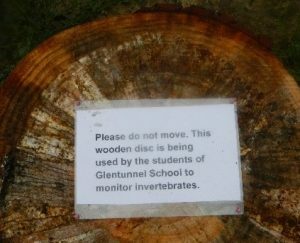 Under this wooden disk, Glentunnel school found the following species; slugs, millipedes, a crane fly, ants, earthworms, slaters, a swift ground spider, weevils, a flatworm and an unknown Spider! Thank you everyone who supported our first ever crowd funding campaign for this Stackwoods Bend restoration project. We raised $9,000 with all of your support. We will now commence planting at this site in rainy Spring – date set for September 6th. The goal of this project is to restore a small portion of the Halswell / Huritini River along the stretch on Old Tai Tapu Road, locally known as ‘Stackwoods Bend’, which is very visible to people passing by.